I've been playing along with #The100DayProject, and yesterday I made it to Day 80! The way it works is that each participant picks a creative activity to do for the 100 days and posts what they do each day on Instagram. As well, they are to use two hashtags: #The100DayProject and their own unique hashtag. The purpose of the project, beyond making something everyday, is to help the artists' creativity grow. I can sincerely say that this project has done just that for me. I've worked with materials I've only considered using before. I've picked up supplies and tools that had been gathering dust. I've uncovered forgotten findings and beads. All this in an attempt to make something different from what I made the previous days. If you're just now finding me through this post, you can check out what I did for Days 1-20, Days 21-40, and Days 41-60 in the blog posts highlighted or on the CraftyHope Instagram feed. Today I'm revealing Days 61-80. 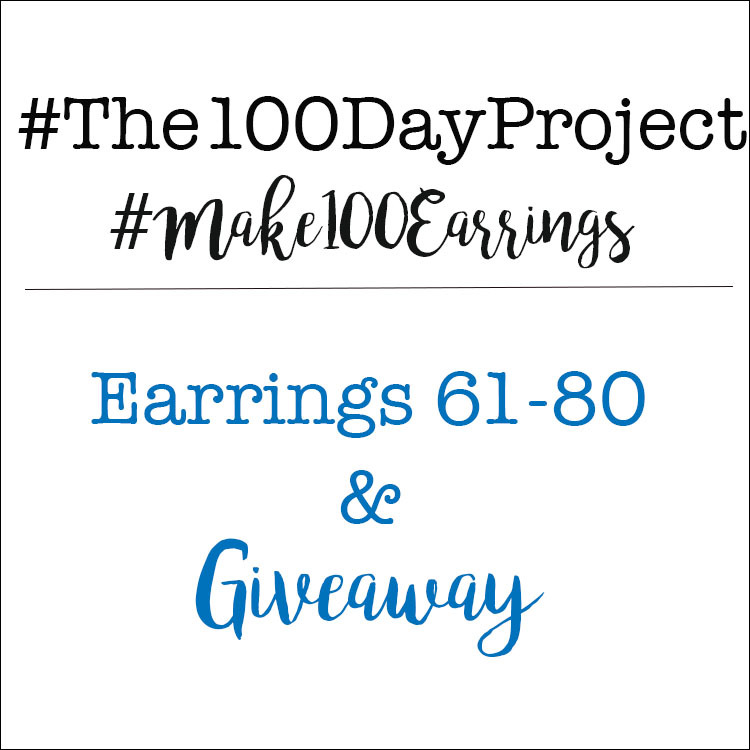 Oh, and my project is earrings with the hashtag #Make100Earrings. 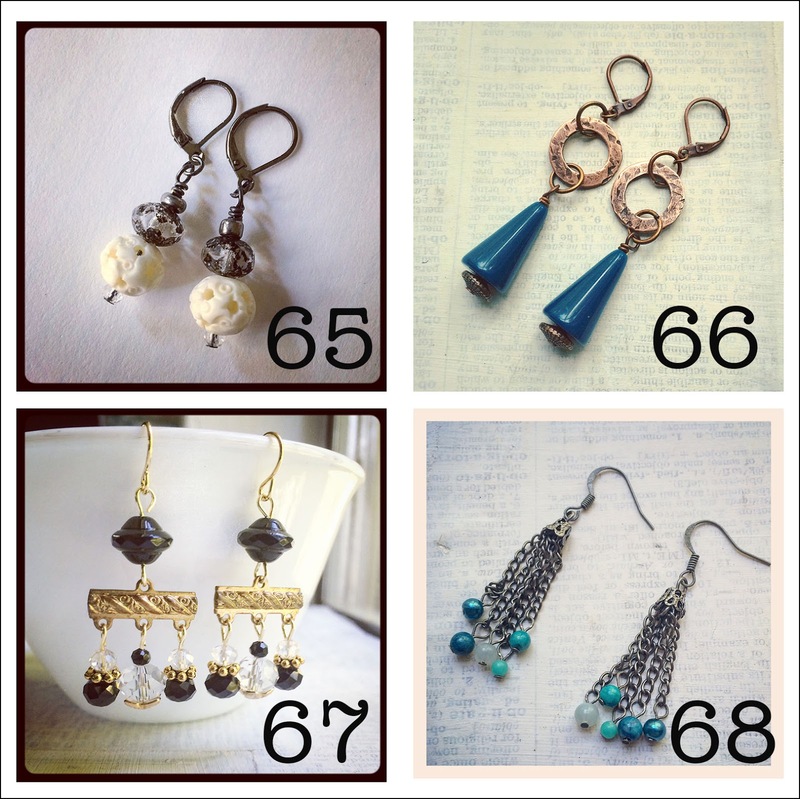 As you can see from the banner above, as well as the title, I'll be giving away some of these earrings. So, pay attention to the ones you like so you can comment with your favorites. As well, I'm announcing the winner for the Days 41-60 giveaway. All of the details will be at the bottom of this post. Let's get to the earrings first! Day 61: The tin shapes were already cut and ready, just needing sealing and accents. It took me some time to figure out what kind of beads I wanted to add. I finally settled on trying to match the colors in the tin with some seed beads and e-beads. As well, I used eye pins to create the ear wires. Day 62: After a long day outside, I was totally beat and refreshed at the same time. I grabbed cultured sea glass beads from ZnetShows.com, a stone bead, and a faux watch hand, simple but pretty. The aqua color totally reflected my chilled mood. Day 63: I woke up that morning knowing that I wanted to etch some metal. I was fortunate to find one small piece of copper in my stash that I snipped in half, cleaned, stamped, etched, hole punched, aged, and sanded. It ended up so gorgeous that I puzzled over whether to add anything else. The emerald green glass beads and copper spacers were just the right touch. Day 64: Tassels are everywhere! After spotting some mass-produced tassel earrings, I was inspired to make my own. I started by stringing the seed beads on a needle and thread by hand before I remembered my bead spinner. Since it was the first time I had ever used it, it took some trial and error, but I finally got the beads strung. As well, I used Iced Enamels to alter the bead caps in which I hid all the "secret" workings. Day 65: I was away from home with my travel box when I made these. I simply dug through the box and picked out beads I like: Czech glass, carved bone, Chinese crystals from ZnetShows, and e-beads, and then stacked them all on a headpin. Easy-peasy! Day 66: After etching the copper the other day, I figured "why not texture some washers?" Using a texture hammer, I banged marks onto the copper washers before patina-ing and buffing them. Rummaging through my beads, I unearthed these neat, teal plastic beads from a vintage necklace I had taken apart. Copper spacers were used on the bottom to finish off the earrings. Day 67: I had been wanting to use strand separators as chandelier earring bases for a while. This gold tone pair was also salvaged from old jewelry. I accented them simply with black and clear glass beads and gold tone spacers. Day 68: The chain fringe for this pair came from the scrapbook aisle. 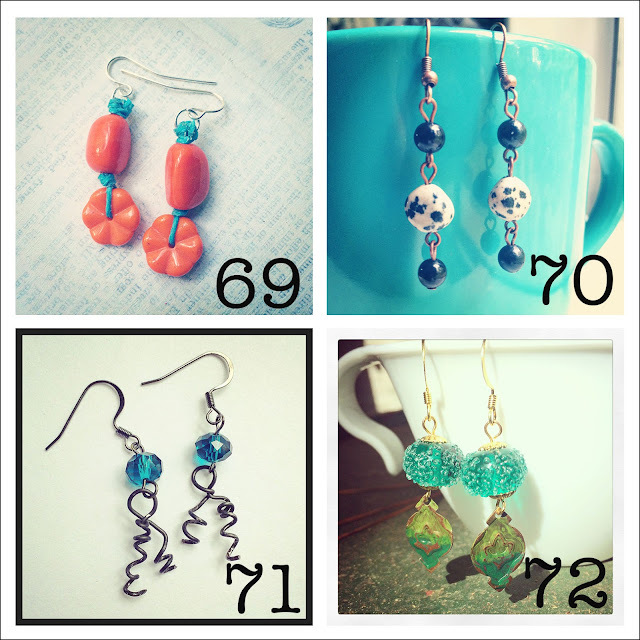 They were Tim Holtz accents that very quickly became earrings with the addition of blue beads and ear wires. Day 69: I'm not even sure what prompted these. As soon as I opened the orange bead drawer, I was drawn to the flower-shaped beads. Since the triangular tubes were the exact same shade, I grabbed them too. They were easy enough to knot together with blue waxed linen cord. Day 70: I knew an untouched strand of dalmatian jasper beads were in my stash. It was time to dust them off. They're paired with a couple of acrylic (to keep them lightweight) black beads and copper findings. Day 71: I woke with visions of grapevines in my head and thus wanted to try to make some with wire. I used sturdy sealed annealed steel wire to achieve my goal and topped them with teal Chinese crystals from Znetshows. Day 72: While sifting through a jar of random beads, I spotted the pair of handmade lampworked beads from SueBeads. They needed to be something other than bead soup fodder. The dangles are altered Vintaj blanks that I had on had. They were textured and colored with patinas in shades of green. I have to admit that they were incredibly hard to photograph and the green dangles are much more muted than seen here. 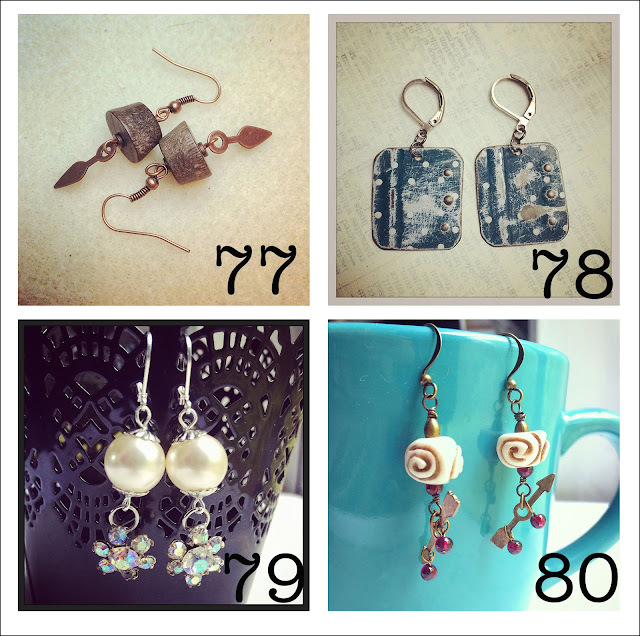 Day 73: Something drew me to these Vintaj stampings and I was ready to play. I layered Vintaj patinas and mica powders to create a mottled design before sealing them with a UV resin. I LOVE how this turned out and hope to try the technique again. It's hard to see, but they ended up looking dichroic. Day 74: My last post on these Shrink Plastic Firefly earrings describes the whole process used to create these. If you've never tried shrink plastic, I definitely recommend it just for the fun factor. 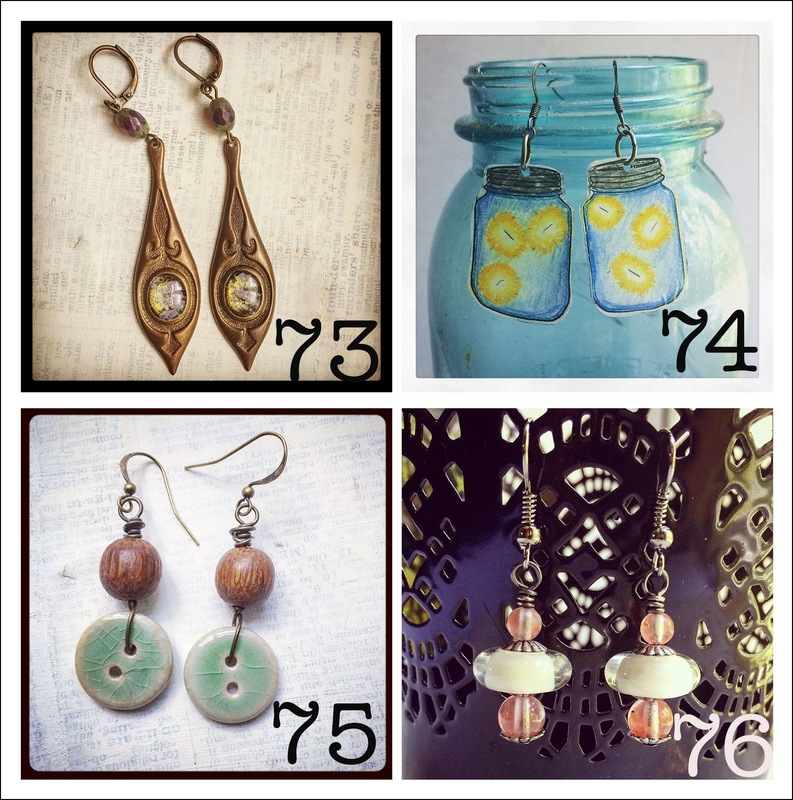 Day 75: The ceramic buttons in these earrings were bought for the Bead Peeps Swap N Hop but were never used. I have to admit that they were still sitting in a basket on top of my bead cabinet. The crackle on them is so great. They could have been fine alone, but I decided to add a simple, natural element with these wood beads. Day 76: Sorting through my artist-made components, I pulled out my collection of lampwork spacers from Juli Cannon of StudioJuls. Since I had no direction, the white ones seemed the way to go. These cherry quartz-colored glass beads give them a soft, feminine feel. Day 77: I wanted to use something out of my "naturals" bead drawer. At first, a baggie of shell beads called to me, but the odd shape of these wood ones overrode that. I accented them simply with little copper dangles. Day 78: It had been a while since I touched any more tin. Rummaging in the craft closet, I found a "new" tin to cut apart. From there, I experimented with making texture on the tin. It worked out beautifully. Day 79: While my soldering iron was out for another project, I added rings to the back of the rhinestone flowers. They were from old, broken jewelry and were screaming for new life. I gave it to them by dangling them from salvaged faux pearls sandwiched between bead caps. Day 80: I had no inspiration. Something about the bone beads drew my attention. They needed something small, but natural, to accent them. The tiny garnets were perfect along with oval brass beads. Once I decided on the brass, I stumbled across the little brass arrows. I had hoped that they would hang evenly balanced, but that wasn't the case. So, I added a few more of the garnets on either end of the arrows for a kinetic result. They are a little quirky, but I totally dig them. That's where we are now. Eighty earrings down, twenty more to go. I'm not sure what comes next, but I know several days will be spent out of town. That means I'll be working from the travel box. We'll see how that goes. EEK! For now, I mentioned a giveaway didn't I? 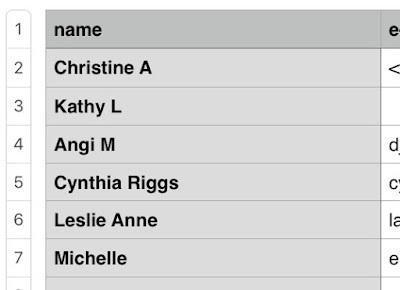 Let me start my announcing the winner of the 41-60 Earring giveaway. Here's who entered. Leslie Anne, that's you! I'll send you an e-mail about getting your earrings to you. 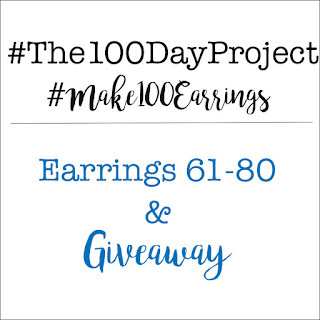 As for the giveaway for this batch, I want to start by mentioning that some of the above earrings are already spoken for and won't be available for giving away. However, that doesn't necessarily mean that your favorites aren't available. Please do let me know which ones are your favorites. How about your top 5? That sounds like a good, round number. Please leave your e-mail address so I can contact you if you win. Again, I'm limiting this to US residents. Comment by the end of the day on July 12, and I'll draw a winner the next day. 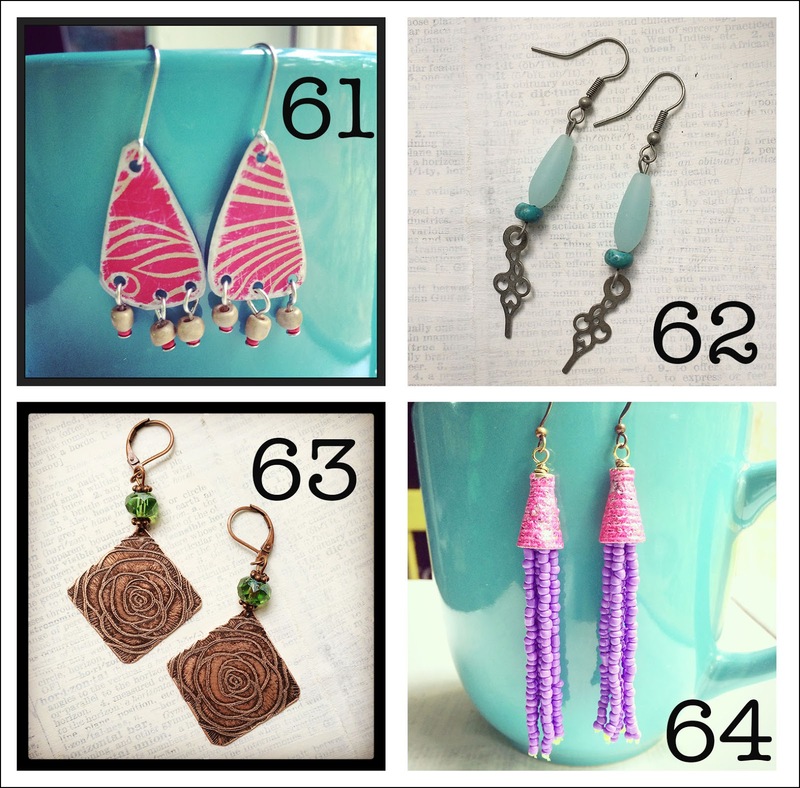 63 because I love your etchings and I love green with copper. These earrings are so me. 72 because I love Sue"s beads and the colors are wonderful together. The parina really adds to the beads. Thank you! I'm smitten with how that etching turned out as well. It's funny, but that stamp was from the Dollar Tree. However, as soon as I saw it, I knew I had to do something special with it. I love the layers. As for Sue's beads, I think this is my second try with these particular beads. They speak so well on their own, I think I've been having trouble pairing them with something. I went really simple with this version. That's always a right move I think! Thanks so much for swinging by! Hi Leslie Anne! I love all of them! They are so pretty! Great creations! wow you've been busy! and what a fun collection with such a wide range of styles!!! I really like #64 ... what a great idea to do a beaded bead cap ... those are just fun! Don't count me, I just wanted to say that I love all the tin earrings and admire your persistence. On the other hand, no day without creativity - this is so great! You did it again! Amazing designs and all so different! So many speak to me this time...#'s 61, 62, 63, 65, 68, 72 and 76. OK, so I know that's more than 5 but it's so hard to choose! Thanks again for the giveaway! Thank you!! Choosing more than five is just fine. I'm just interested in know what draws everyone's attention. I appreciate you giving me such a list. I think this batch is my favorite so far. I'm not even sure this last set that I'm working on will beat the ones here. We'll see though. Thanks again!